I'm a sucker for stars and hears and i was so so so happy when i got this Jumper for Christmas! You may have remembered my little Xmas gift list - Here it featured this jumper that my step dad was getting me, and i got it and i Love it. So here is my first ever OOTD! Hope you liked my first OOTD ! I love your jumper - it looks very cosy and warm! its so warm Hannah, and thank you for the lovley compliments i love the nail colous and you can get it from any orly stocklist. Cute outfit!! And of course, the polish is lovely ;0). Love that color. 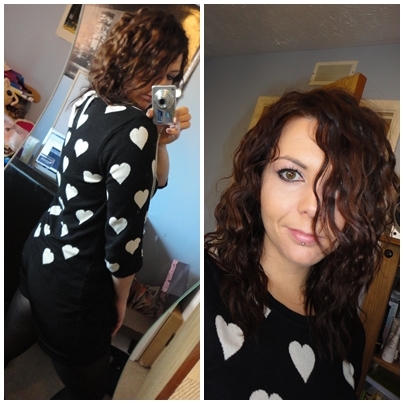 Oh that's a gorgeous jumper, I love hearts on anything! I have a very similar cardie! 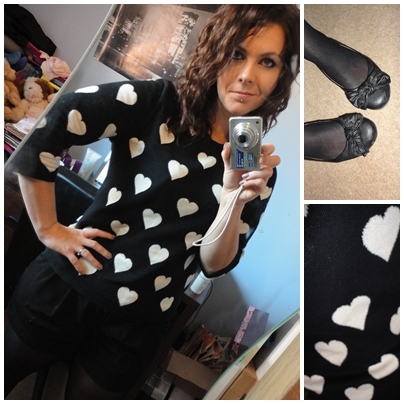 shorts are my new thing since i lost a bit of weight i dont mind them in tights and shorts! your hair looks gorgeous! and your eye make up! I've been having real problems trying to do OOTD's on self timer- never thought 'in the mirror' photos could look so great! Might have to copy you on that! Congratulations getting picked for blog of the week! Aww thanks your make me blush :D.